Dozens of Palestinians suffered the effects of tear gas inhalation, Saturday, after Israeli soldiers assaulted hundreds of residents marching in solidarity with hunger striking detainee Mohammad ‘Allan, in Kufur Qaddoum, near the northern West Bank city of Qalqilia. 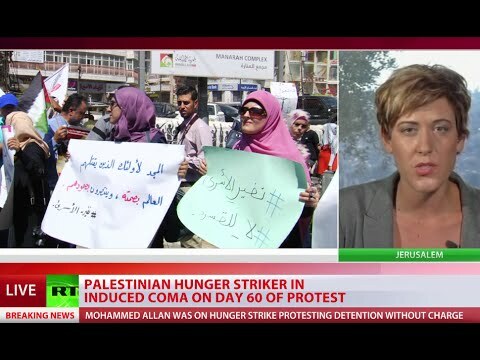 Morad Eshteiwy, coordinator of the Popular Struggle Committee, said hundreds of Palestinians marched chanting for ending the Israeli occupation and crimes, and for the unconditional release of all detainees, especially ‘Allan, who fell into a coma on his 60th day of hunger strike. Eshteiwy added that the army also fired rounds of live ammunition and gas bombs, in addition to spraying the protesters with wastewater mixed with chemicals. Many Palestinians suffered the effects of tear gas inhalation, and received treatment by local medics. He also said that a military bulldozer broke the main pipeline that provides the village with water, causing a complete cut of water service to the town.